When we spotted this picture in the latest Sugru newsletter, we just had to share it with you. 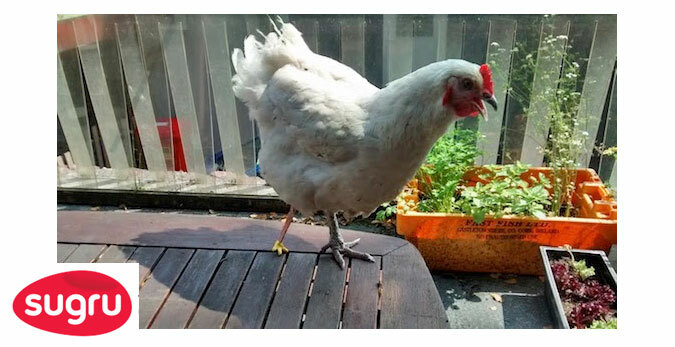 One of their customers used her Sugru for something rather unusual…moulding a foot for the prosthetic leg on her pet chicken. She’s not the only creative one in her family, as it was her father that made the hen’s fibreglass prosthetic leg, following a fox attack. Snowy’s walking has improved since the new leg, and it gives us a warm glow to know that there are such caring chicken keepers out there. There’s eggciting news from Omlet too. The Eglu, and other popular products, will soon be available in New Zealand! Appletons Animal Housing and Poultry Supplies will shortly be stocking a range of Omlet products, along with their own eggstensive selection of chicken keeping accessories. We can’t wait for our Eglus to be on the other side of the world, and we’ll keep you posted! There’s no denying that we’re mad about chickens, but we are crazy about cats too. That’s why we have just introduced something new and exciting, just for our feline friends.. 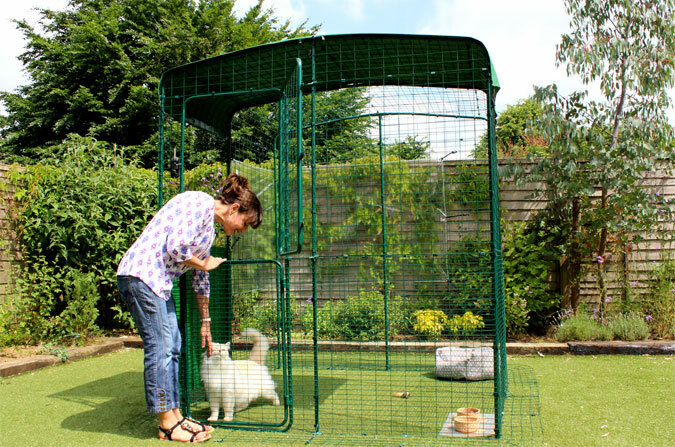 Introducing the Walk In Cat Enclosure – a safe and secure outdoor space for your precious pets. Give your cats the freedom to enjoy the great outdoors without the worry of them running away or getting in trouble. The Walk in Cat Enclosure offers the purrfect combination of style and security. 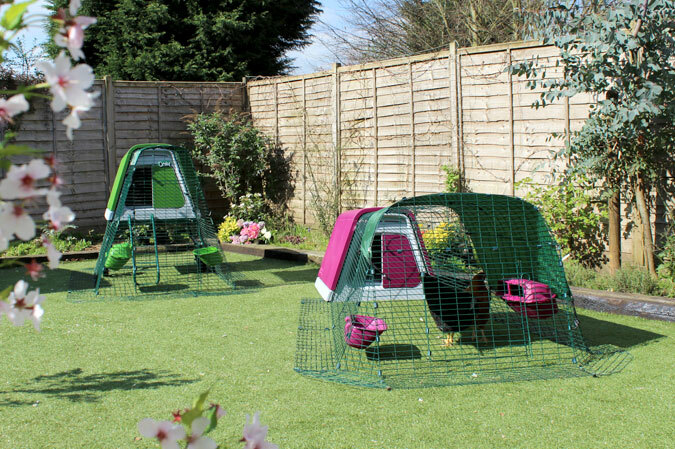 Unlike other runs, this will blend into the garden beautifully, while offering your pet a large space to play, rest and dream of mice. The generous height will allow you to walk in too and spend time with your cat. In stock today from just £365. So if you want to start keeping chickens and the Eglu Go sounds like the perfect choice, click here to read more! 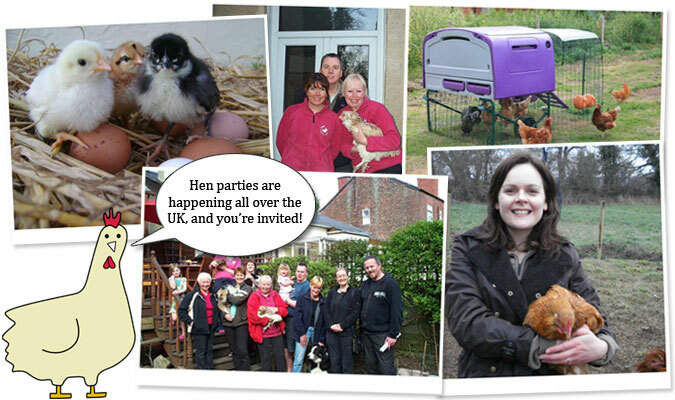 Hop to a Hen Party this Bank Holiday! Looking for something to do this bank holiday weekend? Why not go to a hen party? No learner signs or tiaras required, we promise, and you won’t be forced to drink rub baby oil on any bodies. An Omlet hen party is much more civilised and suitable for all the family. Think tea, cake and learning about chickens, in the company of someone fantastically friendly and fanatical about feathers. (Not feather boas, might we add.) These courses run throughout the UK, by chicken eggsperts and they are the perfect opportunity to learn about keeping hens before you buy an Eglu. Visit our course page to find a hen party near you, and check out the courses below for last minute availability. The Claws are out with the Pussycat Riot! And now let’s put the spotlight back on cats, with a rather unusual new story. An internet privacy company has just launched a range of rather ‘cat’roversial products, dubbed The Pussycat Riot. 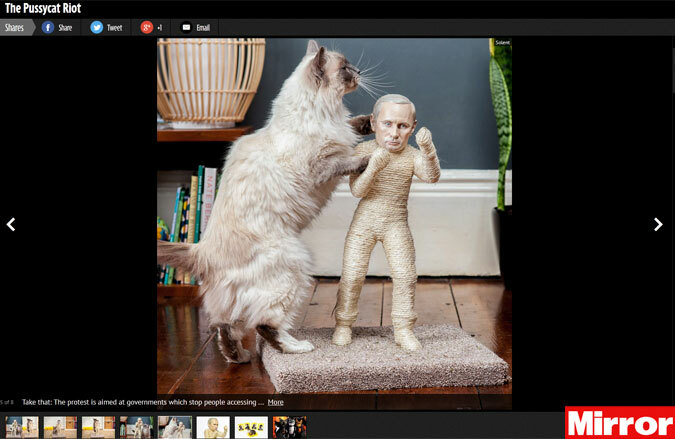 They have created cat scratching posts modelled on North Korean dictator Kim Jong-Un and Russian president Vladimir Putin. Encouraging moggies to maul models of political leaders in protest? There’s one word for that – MeOW! There’s no denying, the details on these pet accessories is incredible, with 3d printed and hand-painted faces. That kind of detail comes at a price though, of £4,500 each, to be purrrcise! A cheaper option might be the litter trays, lined with portraits of Turkey’s Recep Tayyip Erdogan and Egypt’s Abdel Fattah El Sisi. Don’t forget to try your luck at this month’s shaketastic competition! Simply answer the easy question on our competition page for your chance to win a year’s supply of terrifically tasty Shaken Udder Milkshake. Don’t worry about overdosing on these delicious drinks because the prize will be divided into four deliveries. Every three months the winner will receive 26 x 330ml bottled milkshakes and 15 x 200ml kids milkshakes. That’s a prize worth over £170 in total – and enough to keep the kids happy too! Fab ideas for you and your pets! 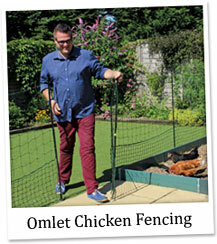 Omlet Chicken Fencing – Give your hens some eggstra space this Summer, with Omlet’s Chicken Fencing. Available in four lengths, this can be used to create an area in the shape and size of your choice, to keep chickens in an area or out of your beautiful flowers or vegetable patch. 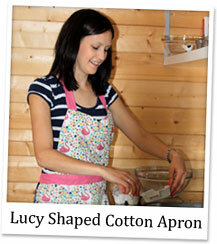 Lucy Shaped Cotton Apron – Not only will this apron keep your clothes safe from spills, but it will have you looking flaming(o) hot! Be sassy while stirring your sauces and feel fabulous frying your fillet steak. With pretty pink flamingos, this is the perfect pinny for every exotic bird. 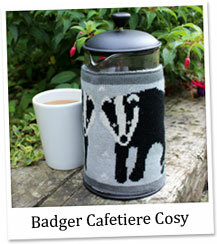 Badger Cafetiere Cosy – This Knitted Cafetiere Cosy fits onto your cafetiere to keep your coffee nice and hot before and between pouring. You’ll find the friendly creature to be just the kind of company you need when you’re not fully alert yet – nice and quiet… We promise he won’t badger you!